If you’re a woodworker looking to take your skills—and your next project—to a higher level of craftsmanship, you might want to consider coloring your wood with chemicals and dyes instead of stains. Unlike stains that can trap light and obscure grain patterns, chemicals and dyes, when handled properly, are one of the best methods for enhancing a wood’s color or accentuating the grain pattern. A classic technique that’s been practiced for centuries, coloring wood is a sure way to infuse a “wow” into your woodworking efforts. French polishing is widely considered to be one of the most beautiful way sot finish wood. This concise, no-nonsense guide to the proces of applying layers of shellac to create a rich, high-gloss surface includes all you need to know about French polishing, from chooosing materials and settin gup your workship to prepare the surface and applying the finish. By Derek Jones. Old furniture, whether a treasured heirloom or consignment shop find, is often better made than anything that can be bought today. So, why let damaged finishes detract from a beautiful piece when you can repair or refinish it in a way that preserves the piece and makes it look as good as new? 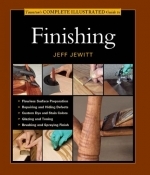 Author Jeff Jewitt, a professional refinisher with over 30 years’ experience, shares his tricks, shortcuts, and tools of the trade in Refinishing Furniture Made Simple, an easy-to-follow book/DVD set that is sure to fly off the shelves. Weekend refinishers as well as professional woodworkers will benefit from the insider tips on how to evaluate the condition of a piece to decide the best strategy for rejuvenating it, repair and revive finishes to enhance their beauty while preserving their patina, and match an old finish for a seamless look.